Veneers can transform the appearance of your teeth. These wafer-thin custom-made strong and smooth porcelain shells are designed to cover the teeth’s front surface, improving your smile instantly. With veneers, your dentist from BrightSmile Avenue can change the color, shape, size or length of your teeth, resulting in a makeover. Think of it as a facelift for your teeth. If you have teeth that are discolored, severely stained, broken, chipped, worn down, smaller than average, uneven or irregularly shaped, you can benefit from veneers. They work too for closing the space between gaps. Porcelain veneers mimic the light-reflecting properties of your teeth, making them look completely natural. Veneers are a celebrity secret to getting that perfect smile. See: Zac Efron, Demi Moore, Hilary Duff, Nicolas Cage, Victoria Beckham, Miley Cyrus, Blake Lively and so many more. “Everyone in Hollywood has veneers… The first thing that happens when someone starts their career and moves out to LA is their agent tells them, ‘You’ve gotta get veneers now,’” aesthetic dentist Sivan Finkel told Refinery29. But you don’t have to be a celebrity to get them. The road to getting veneers will start with a consultation with BrightSmile Avenue. Your dentist will examine your teeth to make sure that dental veneers are a good option for you. X-rays and impressions of your mouth and teeth may be taken. In cases of broken or chipped teeth, some patients require only one veneer. But those who want an even, symmetrical smile may need six to eight veneers. The most commonly applied veneers are the eight top front teeth. To prepare your teeth for veneer application, your dentist will remove half a millimeter of enamel from your teeth’s surface—that’s about the same thickness as the veneer that will be attached to your teeth. A model or impression of your teeth will be sent to the laboratory so your veneers can be produced. You will then return to your dentist for the application. In some cases, temporary dental veneers may be placed on our teeth. 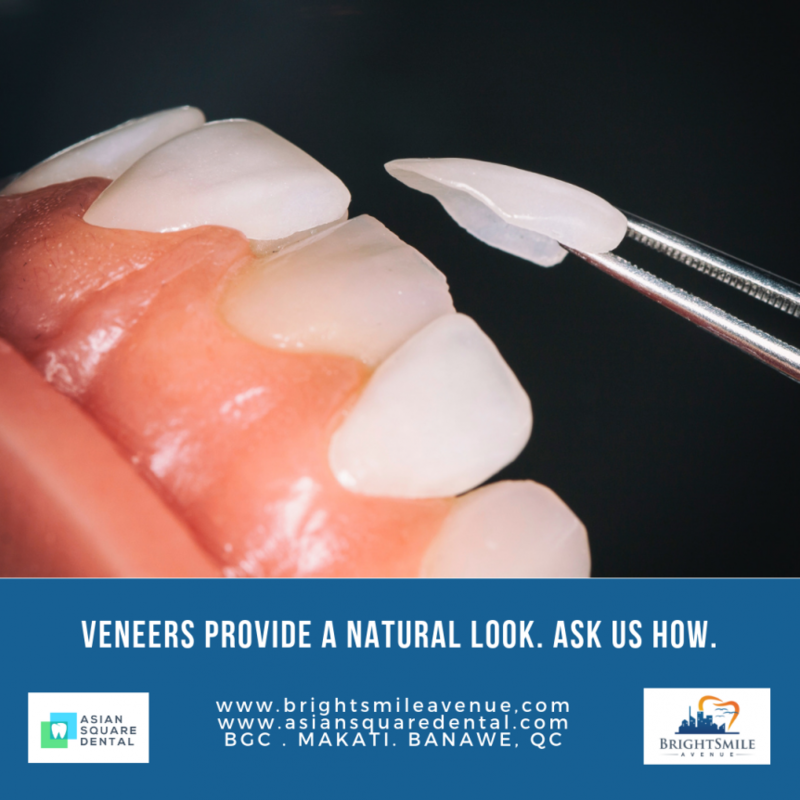 Veneers are permanently bonded to your teeth and your dentist will do this with utmost care, trimming and adjusting until the proper fit and color are achieved. The veneers will then be light-cured for 60 seconds on all surfaces. Veneers don’t require a long recovery time. Your new smile will be ready for flashing when you leave the clinic and you can chew and eat like you normally would. A follow-up visit may be requested so your dentist can check on the veneers’ placement and see how well your gums are adjusting and how comfortable your are with your new smile. Porcelain veneers are stain-resistant and can give you the appearance of whiter teeth. They’re a more aesthetic and less intrusive alternative to crowns. Veneers last from 10 to 20 years. They do not need any special care—just continue your good oral hygiene habits. Interested in getting veneers? Visit your dentist at BrightSmile Avenue. Call 6212556 to book an appointment. Hi, can I ask how much? I’m really into veneers. Hi Carlo. Yes we would love to talk to you about our veneers. Did our secretary Mika call you? Please let us know. Thanks! How much is the cost for porcelain veneers?per unit? Hi Mam Ghie. We already gave you a call mam. Thanks for the inquiry! How much are porcelain veneers in the Philippines?